As a farewell gift to me, my colleagues at the World Bank compiled a cookbook of recipes from each of their home countries. This is my first blog post and to honor them I am featuring one of my favorite dishes from Peru, Lomo Saltado. Thank you, Ruth Delgado Flynn, for sharing your recipe with me. I have made some changes to the recipe because I could not find Aji Amarillo (Peruvian yellow hot pepper). So, I replaced it with Aji Amarillo paste and Panca Pepper paste. The dish tasted authentic, with just the right amount of heat from the aji pepper paste and I was thrilled that I could make it at home! I made the French fries from scratch but you can use store bought frozen fries. 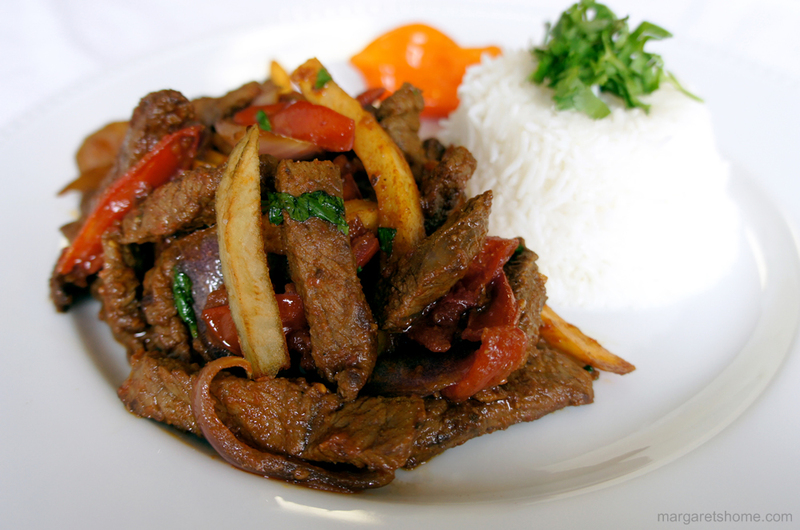 If you like Lomo Saltado, give this recipe a try. You will not be disappointed. Keep checking my blog because you never know when I will feature another recipe that you shared with me! Peel potatoes and cut them lengthwise into ¼ inch thick fries (French fries). Rinse fries several times until the starchy water turns clear. Cover them with cold water and with three cups of ice cubes. Leave them in the water and ice for about 30 minutes. Heat oil for deep frying in a large wok until the temperature reaches 325 degrees. Pour ice and water off and wrap fries in a clean towel and pat completely dry. Add a handful of fries at a time to the hot oil and cook until the fries turn light golden in color. About 8 minutes. Remove fries with a slotted spoon and place on paper towels. Drain for ten minutes. Cook remaining fries. When you are ready to serve the Lomo Saltado, reheat the oil to 350 degrees and fry the French fries again until light brown and crisp. Remove fries and drain on paper towels. Sprinkle a teaspoon of salt over them. Gently add them to the prepared Lomo Saltado just before you serve. Cut beef into ½ inch thick strips. In a bowl add garlic, ginger, aji paste, panca paste, soy sauce, red wine vinegar, cumin powder, pepper powder and beef. Stir so beef is well coated and marinate for 20 minutes. Heat 1 tablespoon of oil in a pan until very hot. Place half the pieces of beef and let it get brown on one side before you turn it over (about three minutes). Do not add liquid from marinade. Stir fry until all the beef turns brown. Remove and add another tablespoon of oil and repeat the above process with the rest of the beef. Remove from the pan. Add the last tablespoon of oil and add red onions and stir fry for two minutes. Add tomatoes, a pinch of salt and the beef and stir fry for another two minutes. At this point if you want a little sauce sprinkle two tablespoons of water and stir fry for a minute. Add French fries and cilantro. Serve with white rice.